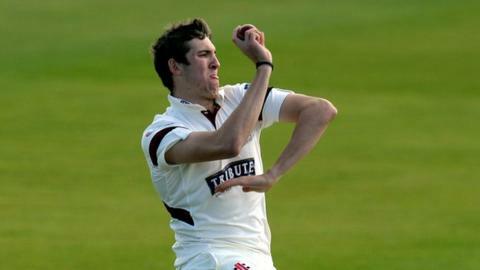 Somerset's Craig Overton has been given a two-game ban by the England & Wales Cricket Board's discipline commission for his third breach of on-field behaviour rules this summer. The all-rounder was reported by umpires Alex Wharf and Ian Gould during this week's Championship game with Sussex. Northants fast bowler Rory Kleinveldt was reported for the same Level One offence in the game against Glamorgan. But as this was his first such rule breach, he receives only a reprimand. Level One breach of the directives . . .
A Level One breach is using language that is obscene, offensive or insulting and/or making an obscene gesture. It carries a three-point penalty. The three-point penalty will remain on Kleinveldt's record for a period of two years, as will Overton's latest punishment. As Overton has now received three separate three-point penalties, he will miss Somerset's final County Championship match at home to Warwickshire next week (22-25 September), as well as next summer's first Championship game. Overton, who missed the start of this season with an ankle injury, was this week named in England's Performance Programme and Lions squad for this winter's tour programme. Next week's game at Taunton sees sixth-placed Somerset, at home to the team one place above them, still needing seven points to assure themselves of safety.